One of the quests for illolifeRPG is to illustrate your own personal beasts that beset you along your journey. This is my first and one of my more frequent foes. Ever since I've started identifying this particular beast that haunts my thoughts, I've seen her effects on me so clearly. It's pretty frustrating when you know what's happening and feel powerless to stop it. 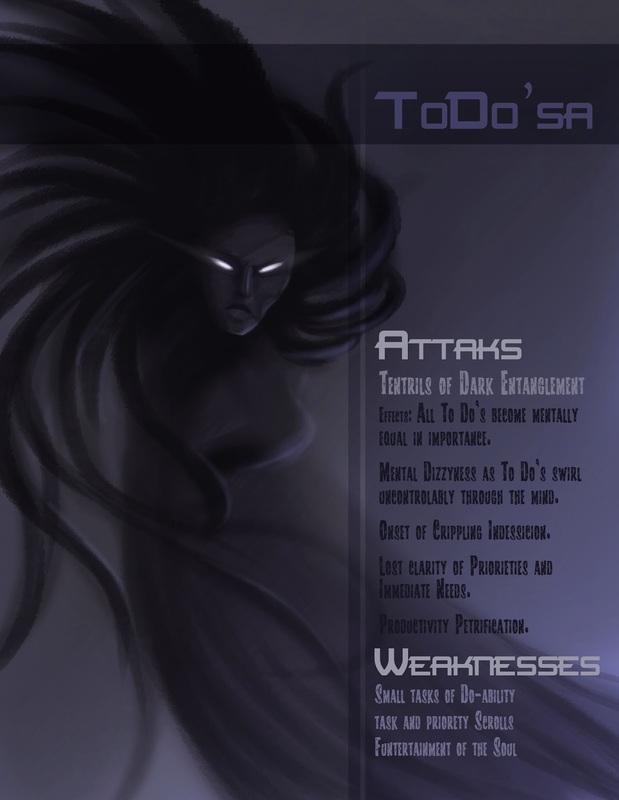 ToDo'sa is Medusa's nasty wraith-like cousin. Once one of the most productive illustrators, but because of her pride and lack of direction was cursed to live of the productive powers of others. Her end effect and goal is to petrify the productivity of those she latches on to so she can feed on the productive powers they do have. We all have the time and power to be productive! This little beastie just gets in my way sometimes... a lot of times. We all have the power and the time to be productive and to progress. Sometimes, I feel like I have one of these little beasties leaching my productive energies from me. Many a time I've been in the depths of Productivity Petrification. I just submitted this illustration in a contest on the School of Visual Storytelling facebook page. Submissions close the 21st this month. "Kaia was diving in tropical waters when she discovered it! It shimmered and glistened in the light as she wondered how to get it up to the boat before anyone discovered her secret." This was such a fun illustration! The challenge of illustrating reflective, shimmering, and luminous lighting was a fun one to tackle. I did my best to take a more unexpected take on the prompt than the light hearted, surprise treasure discovery. 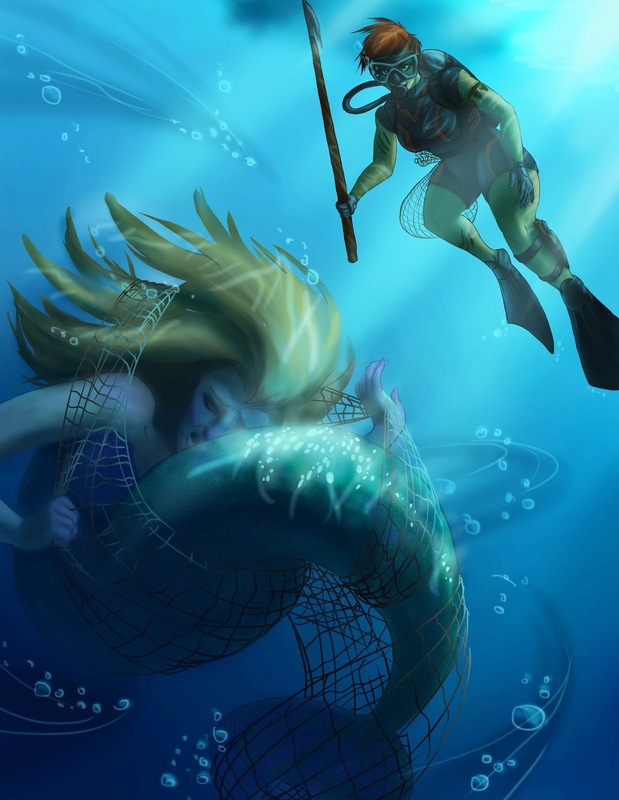 A feisty ocean poacher stumbling upon an entangled mermaid seemed like a much more interesting story to illustrate. Enjoy! 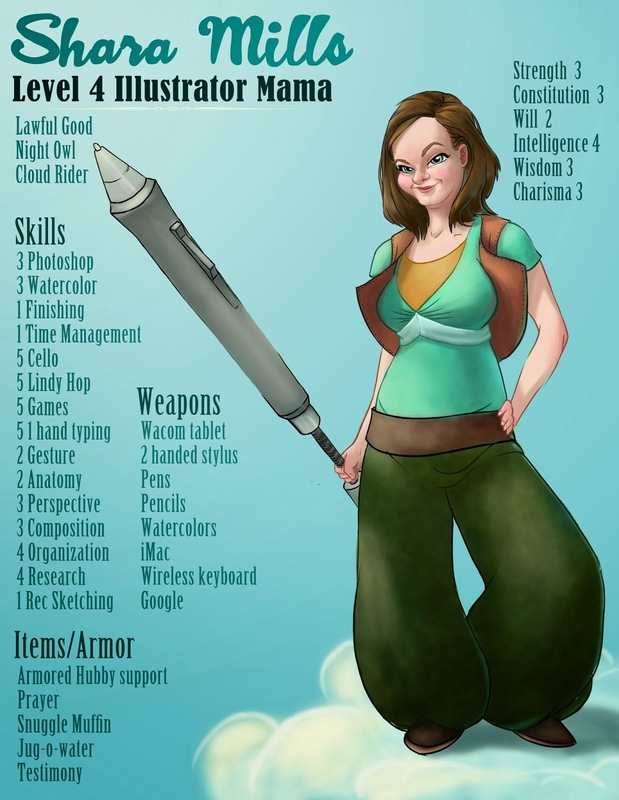 illolifeRPG - Character Sheet - Level 4 Illustrator Mama! You know how kids are way more motivated to work if they're having fun? Why do we forget that handy trick as we get older? It works when you're 5. It works when your 25. I'm proof! This is my first character sheet for a new FB group called illolifeRPG alpha. The idea is that you get XP and level up as you set goals and achieve them. Participating has really helped me be more motivated and productive in my life and my art. It feels so great! If your a creative body, I highly recommend checking it out. Especially if you have a bit of a fantasy or gaming streak. Interesting to note: This is the first piece where I used several layer masks so I could freely paint and still keep a clean silhouette. I've used masks before, but I usually paint the negative space around the outside of the whole subject. This time I blacked out the whole mask and painted back in the space I wanted to keep. I also had a few separate layers like skin, hair & clothes, and sword. I also had fun using colored line. I just locked the pixels for that. Things I love about this: My first self portrait I actually liked as I worked on it and as a finished piece; Aladdin pants! I'm so getting a pair for real; The idea of flying by means of riding clouds; and that I turned my Wacom pen into my two handed foam sword. Now I can conquer my foes and my projects! On today's painting I wondered about how to choose background and shadow colors. I started with an idea of a different background color, but it wasn't working. 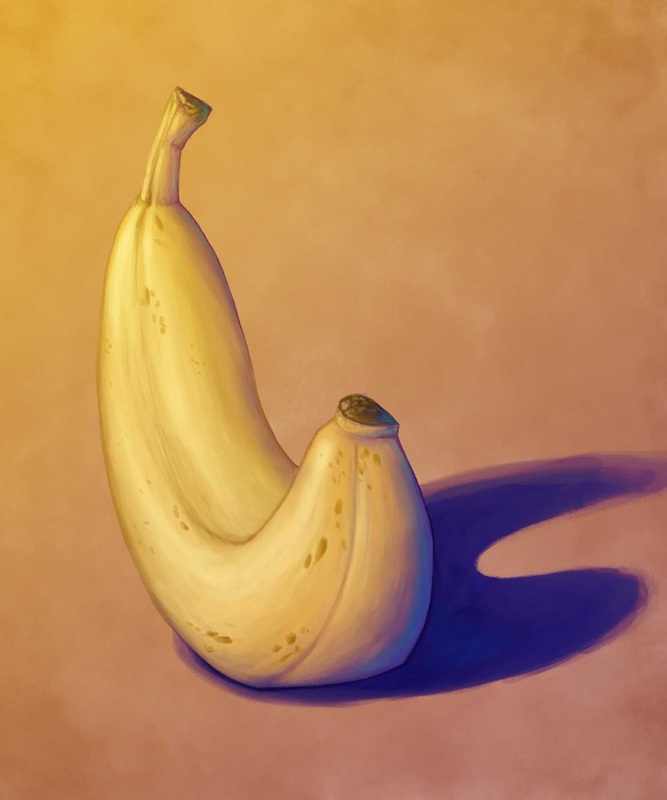 It's pretty tricky to build up a nice Y/YO banana on a sky blue background. I fiddled with it as I went and wound up with a background very similar to the apple speed paint's. This kind of worried me. I don't want to have all my work be the same. Instead of dwelling on these kind of fears and concerns I decided to put them aside and look at the pros of what I was doing. -I'm actually finishing little paintings for practice! WOOHOO!!! -If I end up practicing the same thing for the whole alphabet then I might be getting onto something that I really like and would be starting to get familiar with. -I don't feel like my work has had as much of a consistant feel as I'd like it to. Doing the same/similar thing might help me find a groove that I can work with in any application. -I won't actually be doing the same thing every time even if it may look like that. I'll be learning and applying new things every time. -These little paintings make me feel really good. As long as I'm working to get better, even if it all looks the same, I'm still moving forward. I did this speed paint in about 2 hours. 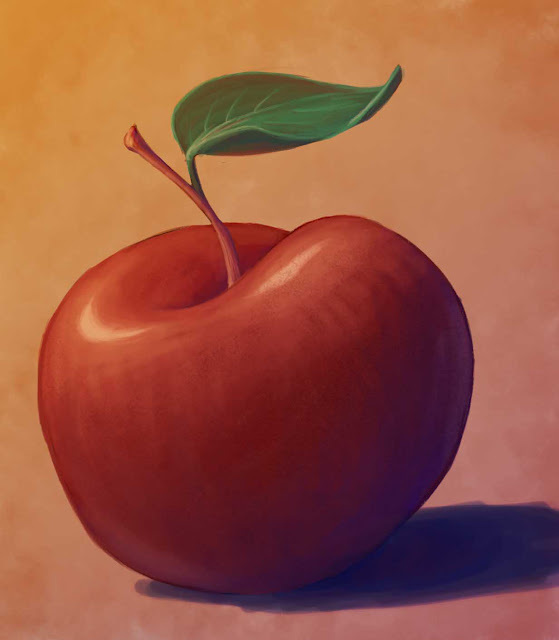 That may not seem very speedy, but for me to get something "finished" that quick, even a little study of an apple, is pretty sweet! I got inspired after watching a video Hollie Hibbert put up on her blog of a study she did. I still have some questions about specific parts of her process, but it was a great exercise for me. I even made an ABC's list of subjects that Brandon helped me choose for further speed paint exercises. PS: if you haven't seen Hollie Hibbert's work, you can check it out at her blog here. She graduated a few semesters before I did and her work has always been very inspirational to me. Thanks Hollie! Contact me for pricing on prints or originals. I'm a mother, wife, developing artist, and a daughter of God among other things. How these different elements of my life will ultimately fit together in the eventual masterpiece of me is a bit of a mystery right now, but I know that with time and effort it will come together beautifully! A:M 2005 Training Now Free! Recordario: Me mudé a Tumblr! / Reminder: I've moved to Tumblr! Memorial Day Promotion - 25% off to all Veterans and Families! Do it, "for the Fat Lady"
Sketch Fighter - o blog de batalhas entre ilustradores mais caótico da internet! It’s a Circus out here.. Does a Band-Aid use humans? Shannon Associates -- the premier source for illustrators and illustration.